In June 1812, 17-year-old John Le Couteur, an officer in a Canadian regiment of the British army, arrived in Halifax to learn that war had broken out between the United States and Great Britain. For the next three years Le Couteur campaigned from Halifax to Fort Erie and left an entertaining memoir of his experiences full of tales of storm-tossed voyages, arduous winter marches, battles on land and water, the perils of matrimony, high and low society -- and the occasional ghost story -- played out against the spendid scenery of North America. A man of the Regency period (a time of public manners and private passions) Le Couteur recounts his true life adventures with drama and action, laughter and love in an engaging and easy style that reads more like a novel than an historical memoir. Quality softcover, 6 x 9 in; 308 pp. "Don Graves does another skillful and entertaining job of bringing the diary of this young lieutenant to life in this well presented book. 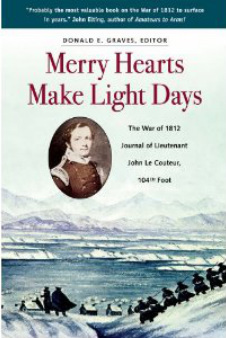 ...... Due to his fine scholarship, all of ... Graves's effort have added significantly to the published record of the War of 1812, and Merry Hearts would be included in that company. This one should be on the shelf of everyone interested in the War of 1812." "provides an unusual perspective on the war, written as it is by a high-spirited, well-educated young Englishman with a gift for turning deft phrases." "Invaluable for students of the War of 1812, this work is as important to the study of that conflict as the writings of Costello, Kincaid or Harris are to the Peninsular War. Also recommended to the more general Napoleonic enthusiast. "Le Couteur was an acute observer of life as well as a natural writer with a relaxed and thorough style. His observations give us a balanced picture of both the chaotic horror of the battlefield ... and the controlled social mores of garrison life. And in Donald Graves ... Le Couteur has found an ideal editor." "a valuable contribution to the literature on the war that both sides won." "a welcome addition to the growing scholarly literature on the war and a rare personal account of a British soldier who fought in it. The journal has received thorough and professional editing from Donald E. Graves, who provides a useful introduction to Le Couteur's life as well as a painstaking annotation of the text." "an epic of hardships endured ... garrison life, not to mention fighting" that "rivals those of the best of the Peninsular memoirists. Students of ... the British army of the period will find the lieutenant's journal an invaluable mine of detail; and any reader will find it a pleasure." "We can ... be grateful to Donald E. Graves for the skilful and painstaking manner in which he has edited the journal of Lieutenant John Le Couteur ...... military historians will welcome it as a first-hand account of army life at the beginning of the nineteenth century and the general reader will have the pleasure of discovering in its pages a fresh and attractive ... figure in Canadian history." "While Merry Hearts may be read as an exciting story of a young man risking his life far from home, it is much more. Besides students of the War of 1812 or of Canadian military history, the journal should interest a wider readership because it presents so many insights into other areas like the functioning of the British military establishment, military-civilian relationships, and pioneer conditions in Upper Canada."